Betty is a cyclist I met at Blackstone Bicycle Works (you’ll hear about them in one of my next posts). She was waiting for work to be completed on her bike at the time I talked to her. I think she was also taking a little rest from her biking too. I talked to her about her cycling experience. FOB: How long have you been cycling? FOB: Why do you cycle and what do you think about cycling on the south side? BETTY: I’m a cruiser, I guess. I use my bike for transportation, to get from one place to another. I do my shopping. I use it for recreation. I’m a life-time South sider so I’ve cycled a lot on the south side. I guess bicycle safety is a big issue. Just staying safe on the road. FOB: What do you think of the city’s bike plans so far? BETTY: I like the new plans. Especially the Bloomingdale Trail plan. FOB: How would you describe cycling on the south side? BETTY: South side riders tend to be younger, more youth-oriented rather than older. There are safety concerns for bikers: bike theft is an issue, poor road conditions in some areas, even the physical layout of the south side might prohibit more riders because it’s more residential. There are not a lot of stores in close proximity. 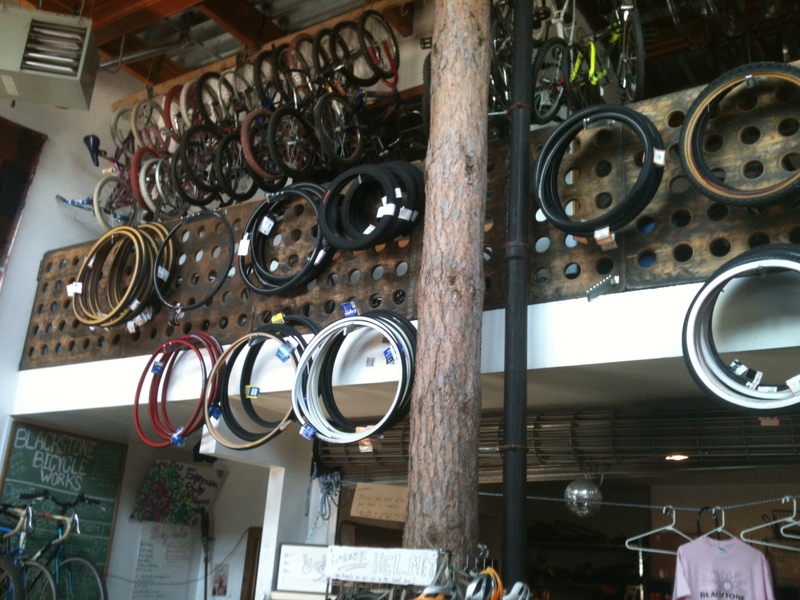 FOB: What is it that you like about Blackstone Bicycle Works? BETTY: I like the fact that it’s green. You know, the way they work is good for the environment since they take old bikes and recycle them. Their work with youth is valuable as they teach them how to run a business and how to fix bicycles. I like the physical layout of the place. It’s comfortable here. FOB: You say there is a special bike lane around your house. Tell me about it? FOB: That’s pretty nice. Thank you for talking to me. Friends of Blackstone Library presents author Greg Borzo Wednesday, March 28, 2012 in “Cycling Chicago”, 6-7:00pm. Blackstone Library is located at 4904 S. Lake Park Ave. Blackstone Public Library is a branch of the Chicago Public Library.